Courtesy of my friend Jillian comes an awesome way to try out all of the great eats on 7th St - what I deem one of the best food streets in the city. 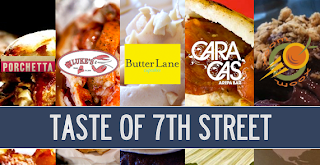 Purchase on Scoopst.com at a 49% discount, $18 bucks gets you a sampling from Caracas Arepas, Luke's Lobster, Porchetta, Butter Lane Cupcakes and Xoom during the "Taste of 7th Street" Festival happening this weekend from Feb 27-28. Come early and stop by Abraco for one of their delicious drip coffees or lattes first! East 7th St. between 1st and A.